A chapbook of poems by Irish poet Doireann Ní Ghríofa, and Choctaw poet LeAnne Howe. 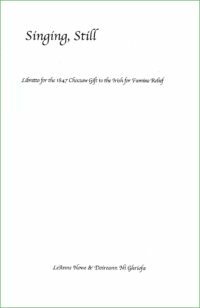 Singing, Still, Libretto for the 1847 Choctaw Gift to the Irish for Famine Relief of “call and response” poems dedicated to our ancestors, the Irish and the Choctaws who lived and died through the hunger years, suffering at the hands of colonialism. The chapbook poetry is trilingual, allowing English to form a bridge between our native languages.